Will politicians be able to solve their own crisis, or shall we step in and lead the way? It has been almost 18 months since the European Commission launched its massive reform of the rules governing road transport in Europe, the so-called Mobility Package. But the EU institutions and member states are still arguing over how to move forward. Meanwhile, investigative reports reveal ever more cases of worker abuse and social dumping in the road transport sector. This situation cannot continue. We need urgent improvements for the millions of professional drivers who move passengers and freight across Europe. But many voices are instead calling for drivers to have less rest, spend more time away from home, and be excluded from guarantees for fair pay when working across borders. Workers and their unions have engaged constructively throughout this process. Now it is time for us to do so again, setting out our comprehensive vision for the EU Mobility Package. 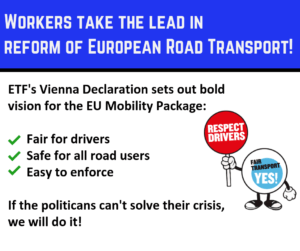 Meeting in Vienna on 30 – 31 October 2018, the European Transport Workers’ Federation (ETF) and its affiliate trade unions from across Europe signed a declaration that offers a way forward. Our reasonable proposals could easily be implemented, and would set up an EU road transport market where fair competition and decent working conditions are the norm. A DECENT NIGHT’S SLEEP FOR DRIVERS. A set of mandatory rest conditions for professional drivers, and a total ban on spending the normal weekly rest period in a vehicle. Freedom for drivers to choose whether they spend their daily and reduced weekly rest periods in the vehicle provided. A RIGHT TO FAMILY LIFE. International drivers should be guaranteed a return to their home country at least every 3 weeks. SAFETY FOR ALL ROAD USERS. Europe needs no further flexibility on driving and rest time rules. The Commission suggests loosening these rules, but we must protect drivers, passengers and other road users from the dangers of fatigue on the road. Tiredness kills! THE SAME PAY FOR THE SAME WORK IN THE SAME PLACE. To prevent social dumping and wage discrimination based on nationality, mobile workers should be paid at the rates of the country where they are working. Exemptions from posting rules in road transport must be limited. The system must be easy to enforce, with sanctions for rule breaking employers. The ETF fully supports the Danish model! AN END TO LETTER BOX COMPANIES. We fully support the regular return of the vehicle – at least every 3 weeks – to the country where the transport company is established. FAIR LIMITS ON CABOTAGE. Using a vehicle for work inside another EU state should be to avoid empty runs, not to distort markets and undercut local businesses. Cabotage must be of a short duration, performed on the way back to the operator’s country. MODERN ENFORCEMENT OF MODERN RULES. We need to shift from paper-based to digital evidence and documentation, with an immediate introduction of the smart tachograph in all vehicles. SOCIAL SECURITY FOR ALL. Every bus, coach and truck driver should be covered by the social security system of the Member State where (s)he usually works. Every driver should also have an EU social security number, to ensure access to aid and benefits and make cross-border controls easier. The EU Mobility Package is a total reform of the rules governing road transport and freight in Europe. A bad reform could have a disastrous impact on road safety and the working conditions of professional drivers for the next decades. Workers representatives have been campaigning for a fair Mobility Package, often supported by partner organisations in the realm of road safety. The European Transport Workers’ Federation (ETF) embraces transport trade unions from the European Union, the European Economic Area and Central and Eastern European countries. The ETF represents more than 5 million transport workers from more than 230 transport unions and 42 European countries. Fair Transport Europe is the ETF’s campaign against social dumping in the European transport sector. We are fighting for quality jobs for transport workers and a safe, reliable service for customers. 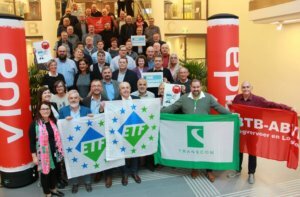 European transport trade unions are standing together to demand an end to unfair competition and exploitation. We’re organising across Europe to show the strength of our movement, building up to an international week of action in March 2019. With the European Elections fast approaching, we expect clear commitments from politicians that they will defend and develop quality work in the transport sector.